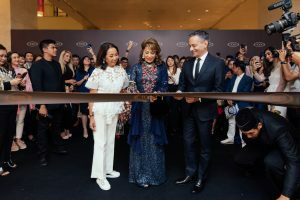 The leading Italian leather brand TOD’S opened up a new concept store in Pavilion KL and what better way to celebrate than with an artisan from the label being flown in to personalise accessories for some of KL’s hottest names? To top off the exciting occasion, the 160 square metre store, complete with travertine marble floors and suspended high-gleam ceilings, was officiated by the HRH Sultannah Hajjah Kalsom. The event showcased the Autumn/Winter 2018 collection and latest accessories by TOD’s were also seen sported by social influencers and celebrities on the exciting evening. The elegant affair by The Melium Group was definitely a reflection of the iconic luxury leather brand. 2.33.01, Level 2, Pavilion KL, Kuala Lumpur, Malaysia.